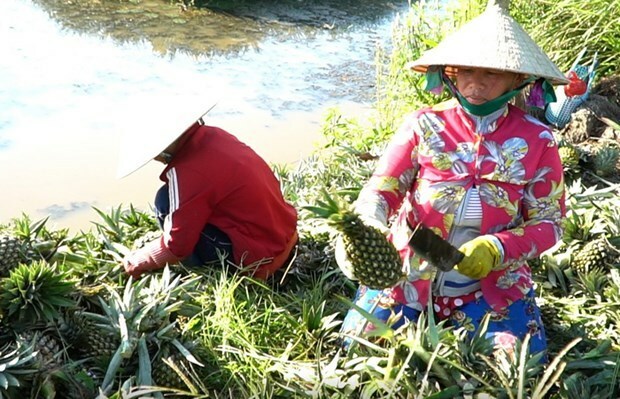 Hau Giang (VNA) - More than 1.6 trillion VND (69 million USD) is needed to carry out a project enhancing competitiveness through promoting the trade of fruits and vegetables in the Mekong Delta province of Hau Giang in the 2021-2026 period. The investment will include 160 billion VND of the corresponding budget, nearly 780 billion VND of the Asian Development Bank (ADB)’s foreign loan, and 46 billion VND of non-refundable aid, while the remainder will come from corporate and cooperative capital. The project features four components: innovation and technology transfer; infrastructure building and equipment; IT development support, organisation and coordination of value chains and credit support; and project management and backup. The ADB’s loan will be used to support infrastructure building and equipment to develop vegetable, mushroom and fruit areas in seven districts and towns across the province. It aims to have at least 20 percent of fruits and vegetables to receive Vietnamese Good Agricultural Practices (VietGAP) and GlobalGAP by 2025 and build at least 2-3 typical agricultural brands. At a working session with a delegation from the ADB national programme on March 18, Vice Chairman of the provincial People’s Committee Nguyen Van Tuan underlined the importance of the project which, he said, will contribute to building a stable supply region of fruits and vegetables, serving rural and farmer development in the coming time. He proposed the ADB support Hau Giang implement other projects in infrastructure improvement, water supply and drainage, waste treatment, climate change adaptation, electricity, health care, transportation, agriculture, and rural development.